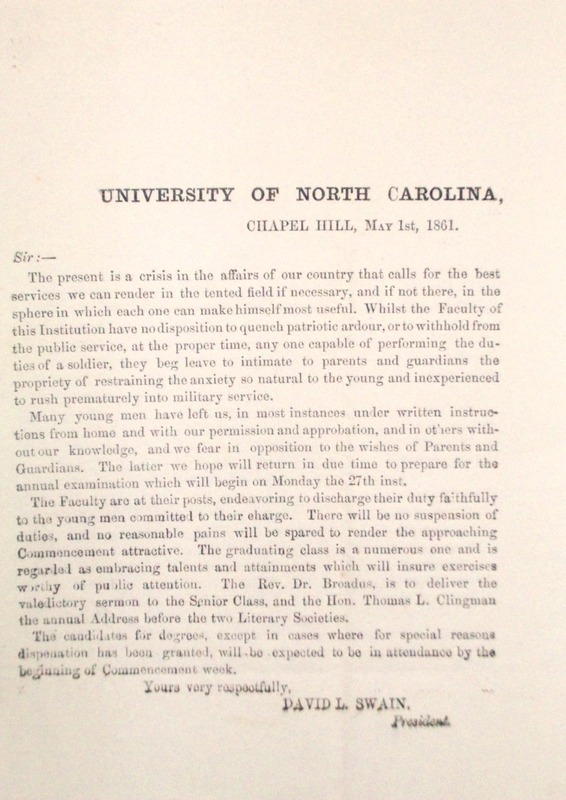 Item desciption: Circular letter from UNC President David L. Swain. North Carolina was three weeks from officially seceding when President David L. Swain issued the first of these circulars. He urged parents and guardians of university students to restrain their sons from rushing “prematurely into military service.” The university, he assured them, would remain open. Item citation: From folder 218 of the University of North Carolina Papers #40005, University Archives, Wilson Library, University of North Carolina at Chapel Hill. This entry was posted in University Archives and tagged Chapel Hill, David Swain, enlistment, North Carolina, students, University of North Carolina. Bookmark the permalink.